I woke up, looked out from the balcony and saw the Mediterranean Sea. The sun was out and the sea was flat – it sure looked like perfect conditions for the race. I had a good breakfast of porridge and started sipping on my to TORQ Vanilla Energy drink, as I knew the conditions would be a little warmer than they are back in the UK. We drove down to Registration and were given Race Number 5 – which was written on my hand. I put on my HUUB wetsuit and then just before the race started, I gulped down a TORQ Raspberry Ripple energy gel. As the beaches were quite rocky and stony, our race was to have a deep water start. So no soft sand to start on this time, which didn’t bother me as I prefer to be in the water ready to race. 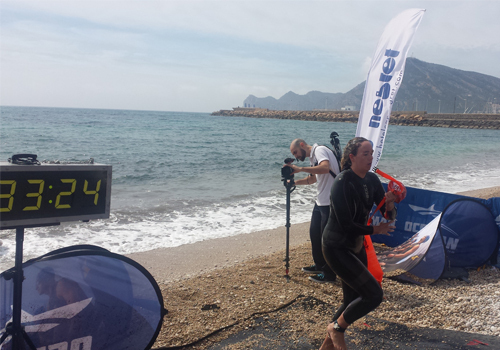 However, after waiting around 20 minutes for the Mayor of Altea to arrive (to officially start the race), the 16°C Mediterranean Sea started to feel a little chilly! The race finally started, with nearly 150 swimmers all wearing tow Floats – it was quite a sight to see a 150 orange balloons floating in the Med! The start was a tad brutal, with arms and legs flying everywhere and swimmers trying to break away from the main pack. By the time we reached the first orange turn buoy, I had had both of my hats and goggles ripped off in the tossing and tumbling of the “swimmers washing machine.” I had to stop to put them on again at around 700m out to sea. Treading water whilst putting hats and goggles on is a pretty difficult thing to do, however I managed it and started to chase down the lead pack that I’d lost touch of. After around 4km, I started to feel like I needed some more energy (as the sprint to catch up with the pack had taken a little out of me). I took a TORQ energy gel out of the sleeve of my wetsuit, ripped the top off and started to take the gel on my front (whilst still kicking). I would normally roll on to my back to take a gel, but with the tow floats in the way, it was hard. Whilst attached to the floats, it was similarly hard to roll around the buoys and over people with them too. Despite the floats being an essential piece of kit for Open Water (OW) swimming – especially when you are on your own or in busy waterways, they’re a little awkward to compete in an Elite level race with. After getting back with the pack, I swam with them for around 1km then two of the other swimmers decided to break away and try to grab a bit of a lead. At this point, I thought “I’m going with you,” so I picked up my speed to stay with them, sat in-between the two (on their hips), thinking that if the waves started to increase, then they would take the hit for me and keep me swimming pretty smooth. When we reached around 6km, it started to feel like the longest race ever, we had just reached an island, which would mark the 6km, but it felt further than that. I took another gel to keep up my energy levels and as we reached 7km, I decided to leave the other two swimmers and pick up the pace a little to push myself further. Just after I left the two swimmers, the waves came and all I was thinking was “you’ve got to be kidding me right no… I’m almost finished!” The wind was getting stronger and stronger and the waves were getting bigger, which was making it harder to spot the Finish location and the last couple of buoys. I knew the Finish was near the harbour, so I decided to look for the masts of the yachts and head in the general direction of them, which helped a lot because they were the easiest things to see. In the last 1500m or so, I saw an orange tow float in front of me, so I gave chase. The waves were still strong, so after the final turn towards the beach, I let them carry me in until I could run out of the water, over the timing pads and the Finish. I then had to quickly pull off my hats and goggles and undo my wetsuit because my shoulders were on fire! I didn’t know what position I was in, or what time I had done, but when I was out of the water and on the carpet, I was stopped for an interview and asked how I thought the race had gone. 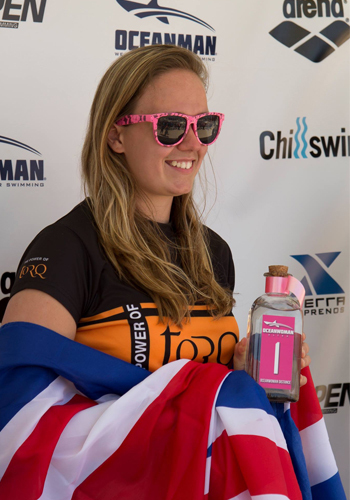 I then found out that I was the first Elite Woman and also the fastest woman out of the water! My time was around 2 hours 33 minutes and I was over the moon! 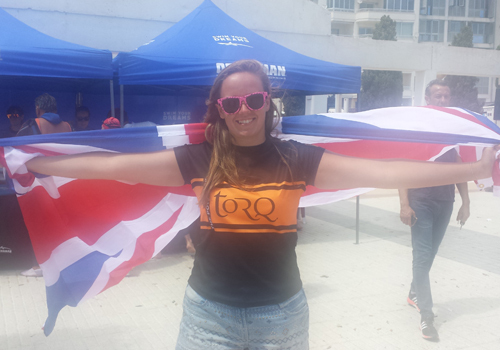 I had just won the Women’s Elite race and qualified for the Oceanman European Final! To be honest, at the beginning of the race, I didn’t think I had such a chance of winning and was hoping to only qualify for the final. With such a high class field and people who race at this level in the Med all the time, I was super stoked to take the win. On the Friday, when we were at the airport waiting to fly out to Altea, my dad asked me what my tactics were for the race. I had said “Swim fast.. Win Race” and that’s what I went out and did – even if I did get my hats and goggles ripped off, a black eye and my neck and shoulders cut to bits! It was one of the hardest races I have ever done, but it was extremely enjoyable and I couldn’t have dreamed of a better result!